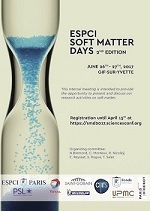 On June 26th and 27th, we organize the second edition of the ESPCI Soft Matter Days (SMD). This internal meeting will provide the opportunity to present and discuss our soft matter research activities in a relaxing place nearby Paris, Gif-sur-Yvette. The event is open to anyone interested, from interns, PhD students, post-docs to engineers, junior and senior researchers, engineers and administrative staff. The meeting will alternate sessions of 10 minutes oral presentations, and large poster sessions to stimulate discussions and collaborations. Registration and submission open until April 15th (do not forget to submit your abstract). The participation is completely free of charges, including registration and meals. Some free accomodations, close to the conference site, are available on the "first-come first-served" basis.